This is one of the most unusual stones in the museum’s collection. The horse rider is almost certainly one of the Sarmatians, a nomadic people who once lived north of the River Danube in the area which we know as Hungary and western Romania. When the Sarmatians were defeated by the Romans in A.D.175 they were compelled to contribute a number of men to the Roman army. Some of them were posted to Britain, including a regiment which was stationed at Ribchester in Lancashire. 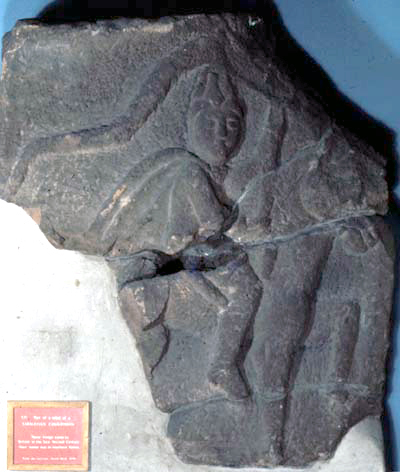 It is possible that the rider shown on this stone was on detachment from Ribchester when he died here at Chester. The missing portion of the stone would have shown that the rider is holding a dragon standard, for which the Sarmatians were known and feared. It consisted of a bronze dragon’s head, with fanged jaws wide open, mounted on top of a long pole. The back of the head was also open, and on to it was fastened a long tube made out of brightly coloured fabric. When the horseman rode into battle at full speed the wind rushed into the dragon’s mouth. The size and shape of the holes in the head were cunningly made, so that the force of the wind not only filled out the tail but made a terrifying shrieking sound.